Treat your taste buds to homemade honeydew-basil popsicles by mixing—until smooth—4 cups honeydew melon cubes, ¼ cup chopped fresh basil, ½ cup frozen lemonade concentrate, and a dash of salt. Pour into popsicle molds, freeze for six hours, then enjoy! Honeydew contains potassium and basil is chock-full of vitamin K.
Make a tasty watermelon gazpacho with watermelon, cranberry juice, cucumber, celery, red bell pepper, red onion, mint leaves, parsley, lime, sherry vinegar, and minced jalapeno pepper. Watermelon is an excellent source of vitamin C, a very good source of vitamin A, and a good source of magnesium and potassium. 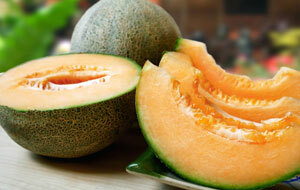 Whirl up a scrumptious smoothie using cantaloupe, yogurt, honey, and ice cubes. Cantaloupe is an excellent source of vitamins A and C.
Of course, if you just want to slice a cantaloupe, honeydew or your favorite melon variety to enjoy as a snack, go for it! With melons, you just can’t go wrong.